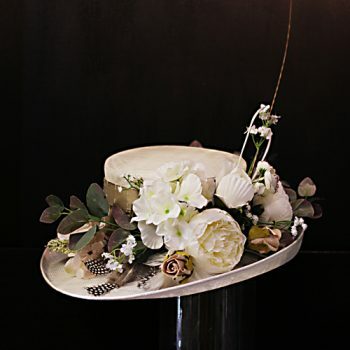 Floral Wedding Hat. Trimmed with white roses, feathers and greenery. £250. 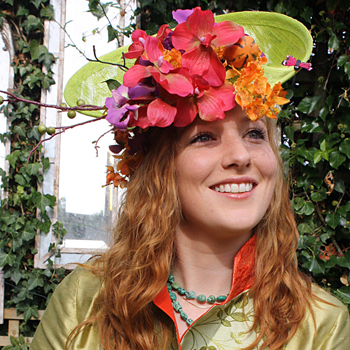 Lime green Plate-hat trimmed with Autumnal Flowers. Attached by a headband and comb. From £195. 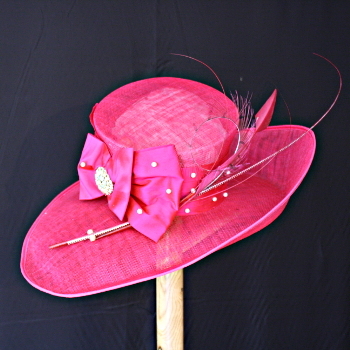 Bright fuchsia pink wedding hat trimmed with feathers and a silk bow. From £250. 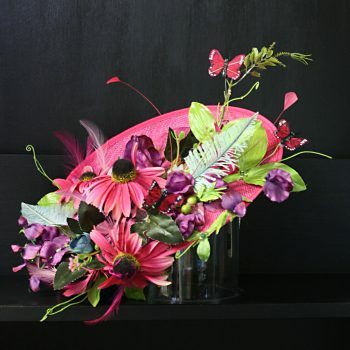 Black saucer style hat trimmed with black feathers and lime green roses. This hat is attached by a headband. From £175. 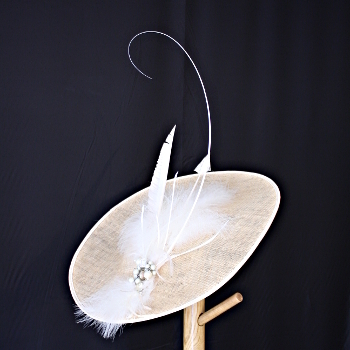 Ivory saucer style hat trimmed with striking feathers. This hat is attached by a headband. From £195. Burnt Orange Mini-topper trimmed with silk organza and feathers. From £195. 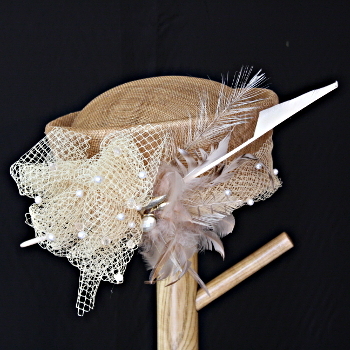 Sandstone Cossack style hat trimmed with feathers beads and netting. From £195. Some people jump at the chance to wear a stunning hat for their special occasion, whilst others will shudder at the very thought. Whatever your feelings, we are here to help you. And, when it comes to finding something to suit you we have a number of choices. 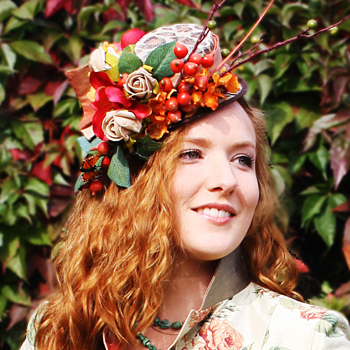 You could opt for one of our traditional hats which vary in size from large and striking to small and stylish. 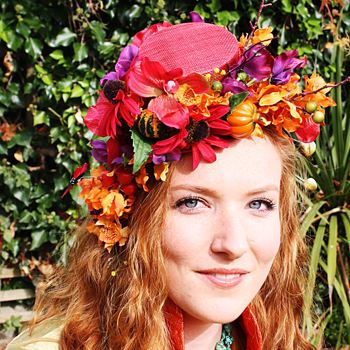 Or, choose one of our saucer shaped hats or mini-toppers, both attached by a headband making them secure and easy to wear. 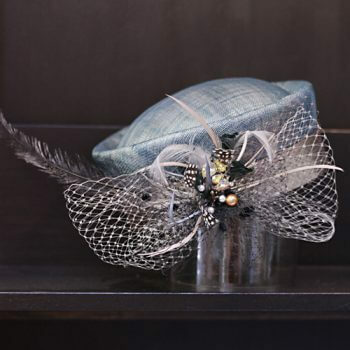 If these are too much why not have a fascinator made to complement your outfit, a creatively arranged collections of feathers and other trims attached to either a headband or a comb. Why not come along to our shop in Stow-on-the-Wold. We always have a a great selection of wedding hats in stock for you to try on for style and colour or for inspiration so that we can make one especially for you. Naturally, if you love any hat that’s in stock, you can buy it there and then. If you are travelling a long way it is wise to ring in advance to make sure that we are here and have time to give to you. Telephone: 01451 870194 Click HERE for a copy of our brochure. Don’t forget to include your postal address and we will send you a copy.